A significant portion of the Splash Mountain ride is contained inside of the mountain. The three Splash Mountain rides all have interior portions in which the story of the ride is showcased. In this article, we review the inside part of the ride and the drops that are inside of the attraction for the Walt Disney World Florida version. The story for the Splash Mountain ride mostly occurs during the inside portion of the ride. 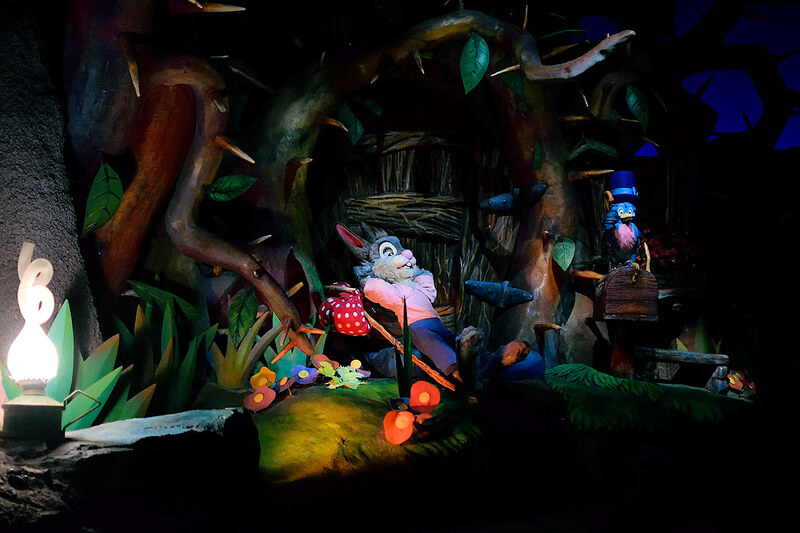 Inside of Splash Mountain, Brer Rabbit’s journey is shown to guests. Guests spend a majority of their time inside of the “mountain” when compared to the outside portions of the ride. The interior of the ride is mostly dark, and the lit up areas are only where the Animatronics are located. To get a better view of what Splash Mountain looks like from the inside, you can visit our video page for the ride. On that page, you can see what the interior of Splash Mountain looks like from the viewpoint of a Walt Disney World guest on the ride. Above photo of the inside of Splash Mountain with Brer Rabbit by Haydn Blackey on Flickr. Photo enhanced by NavFile. Image released under a Creative Commons Attribution-ShareAlike 2.0 Generic license. Most of the drops for the attraction are contained inside of the ride. Three of the four drops for the ride are inside of the mountain. The first drop occurs as guests are entering the mountain. Following the first interior drop, is the second drop that is located right before the Brer Bear honeycomb scene. The last inside drop is at the end of the Brer Bear honeycomb scene, which is right before the cavern scene. That drop is the fastest out of all three inside drops. All of the drops that are inside of the mountain are small drops when compared to the big drop that can be seen from the outside. The second and third drops all occur in the dark, which makes them slightly scary. You can learn more about the attraction by visiting the numerous pages cover several areas of the ride.